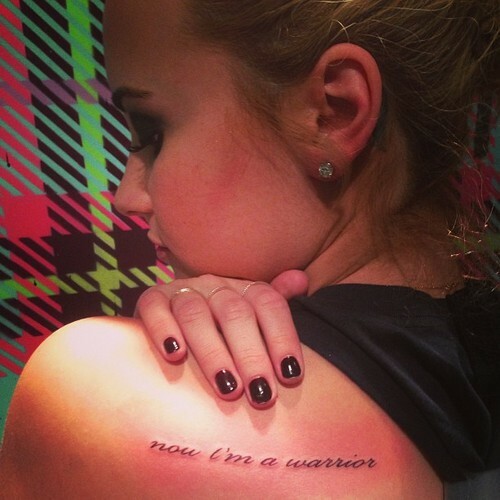 Demi Lovato took to Twitter to debut a brand new tattoo on May 15, 2013, and the ink reads simply “now I’m a warrior” in elegant black script. The tattoo, which is inked on the back of Demi’s left shoulder, is a mantra similar to many of the pop star’s other tattoos – including “stay strong,” “let go and let God,” and “you make me beautiful” – but this time Demi drew inspiration for the tattoo from her own lyrics. As much as Demi Lovato tries to set herself apart from other pop stars, she just couldn’t resist getting the typical pop star badge of honor – a tattoo of her lyrics inked on her body to celebrate the release of her new album. And like any good pop star tattoo, Demi’s was inked by the infamous Keith “Bang Bang” McCurdy in New York City! And you can never hurt me again. Demi Fights Back With New “Warrior” Tattoo! As you can see by checking out Demi Lovato’s new tattoo, her powerful “Warrior” lyrics and the rest of the songs on her brand new Demi album, just when you think the songstress is down, she’s definitely not out. And Demi clearly feels strongly enough about the message she puts across in “Warrior” that she decided to add a tattoo inspired by the lyrics to her already impressive tattoo collection. Many of Demi Lovato’s tattoos in the past have been inked as emotional reminders to herself that she is beautiful the way she is and that she can stay strong in the face of adversary, and these mantras are all very sweet and sentimental. 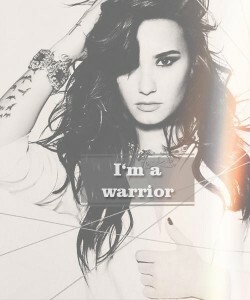 Demi’s new “I’m a warrior” tattoo, however, is all fight and we love it!